Our new online permit portal is live for residential customers. Please review the information below for detailed instructions on how to apply. Residents whose property is in a designated zone A, B, C, E, F, G, H, or J area may be eligible to purchase a residential permit which allows residents to park beyond the posted time limits within the appropriate permit zone. Permits must be displayed on the left side of the rear bumper. Vehicles with permits that are not displayed correctly will be ticketed. All residential parking zone areas allow two-hour parking without a permit during designated times. All zone areas are posted with signs stating the time of day when the two-hour parking limit is enforced. With the appropriate zone permit, you may park beyond the posted time limits. Parking permit rates vary depending on the zone - see the Rates page for more information. Please note that the maximum number of permits issued is five (5) for properties in Zones A, E, F, G, and J. Eugene City Code allows up to five unrelated persons to live in a residence (see Chapter 9.0500 below). If this code does not apply to your situation, please contact us at parking@ci.eugene.or.us. (C) Two unrelated persons and any parents or children related to either. Guest permits are available free of charge in all zones to eligible residents for visitors staying longer than two hours during the posted times. Guest permits are obtainable only by an eligible resident. Residents not currently using the parking program must provide the required information to obtain a guest permit. The City of Eugene has implemented a new online residential permit management system though IPS, www.thepermitportal.com/IPS. All residential parking permits, including Zone J free permits, are now issued through this system. All documents will now be processed online and a new permit can be mailed to your address. Applications can also be completed in our office. 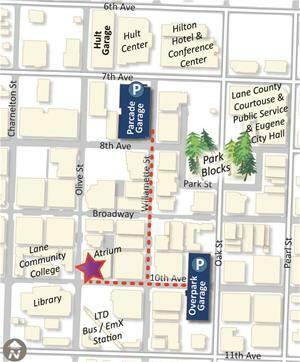 If you choose to apply in person at our downtown office, plan for up to thirty minutes to obtain your permit. To save time, you can preregister online through the IPS system. You'll still need to provide required documents. Please be sure to check the requirements before purchasing any permits. We validate up to two hours of parking in the Parcade and Overpark Garages, which are located within two blocks of our office.